UPDATE: Check out the 2010 Ford Mustang — it's been officially unveiled! The camera shutters of Brenda Priddy's cadre of spy photographers just snapped themselves some hot pony car action — the 2010 Ford Mustang. The new-look Mustang for the new model year will be sporting what appears to be an all-new front and rear fascia in addition to a major upgrade to the interior. We're wondering exactly how much of the Giugiaro concept from last year's LA Auto Show will be making it into the new 'stang. With all of the black tape and leather, we're guessing we can imagine a whole heckuva lot of it. Full spy report after the jump. 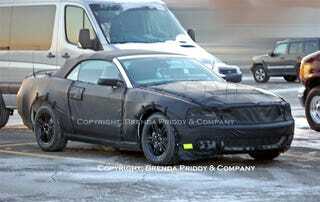 We all expecting a mid-cycle facelift for the 2010 model year, but by the looks of this heavily camouflaged prototype - the 2010 Mustang will be sporting an all-new front and rear fascia - including grille, headlamps and taillights! In addition, the interior will also be updated - although this prototype's interior was also heavily covered and we couldn't get any clues. Our shooter stumbled upon this prototype when he made a wrong turn in ...well, that doesn't matter ... but he found this while making a U-turn (which explains the lack of sharpness in some of the photos). Sharp or not - Mustang enthusiasts will examine every inch of these photos! !